GARDEN CITY, N.Y. — Former Orioles legend, Cal Ripken, Jr., is scheduled to appear on Thursday evening on Oct. 29, 2015 from 6:30 pm to 8:00 pm to meet and greet fans where he will sign autographs and memorabilia at the Steiner Sports Store located in the Roosevelt Field Mall in Garden City, NY. For more information, click here. 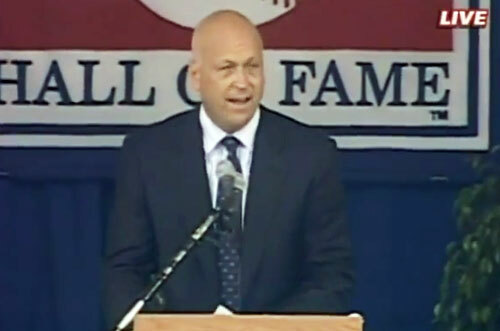 Cal Ripken, Jr., nicknamed “The Iron man”, is a retired MLB baseball shortstop and third baseman who played 21 years for the Baltimore Orioles. He is considered one of the best shortstops and third basemen in baseball history. At 6 ft 4 in and 225 lb., Ripken, Jr. pioneered the way for taller, larger shortstops to be successful at those positions. When inducted into the National Baseball Hall of Fame in 2007, he was a first ballot inductee with the third-highest voting percentage (98.53%) in Hall of Fame history, behind Tom Seaver (98.84%) and Nolan Ryan (98.79%). Sports Speakers 360 is a booking agent for pro athletes. If you would like to book Cal Ripken, Jr. for a speaking engagement, appearance or endorsement, contact Cal Ripken, Jr.’s booking agent for fees at 1.855.303.5450.